Over our ten years in providing pH control, neutralization, monitoring, and management systems to concrete manufacturing plants and many other customers, our team has received a great deal of praise for our systems. We also had a few requests along the way, including comments that indicated a desire to have access to a portable pH control system. The team at Fortrans® listened, and the result comes in the form of our newest CO2 pH control system for concrete industrial process water and stormwater: the Model 5000SP. The steel construction of this mobile pH control system of water treatment is solid and incredibly mobile. In fact, we designed it for maximum maneuverability, which makes it different from our other pH neutralization systems like the 5000B. Wastewater from concrete cutting, grinding, and polishing can be disposed of properly and reused if it is allowed by law in your local area. Custom System Flow and Treatment Capacity – Our pH control systems are scalable to meet your facility’s current and future pH adjustment requirements. 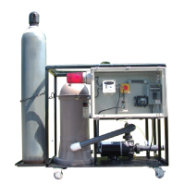 Product Description: self-contained pH control, neutralization, and treatment systems for process water recycling, waste water, and/or stormwater. Systems use safe, low-cost CO2. This system’s dimensions are: 37″ in height, 39″ in length, and 22″ in width. The 5000SP does require a 115V 20 AMP electrical pigtail-type cord connection. Are you ready to order the 5000SP pH control and neutralization system for your concrete process water management? Contact Fortrans, Inc. today at 866-958-7267 to place your order!